The Harrah's Hotel offers a number of ways to make your stay extra special – if you know about them! If you’re looking for tips from in-the-know Las Vegas travellers, download the Netflights Las Vegas e-guide. - Rooms facing the Strip have the best view. - The third floor is the one for pets (and their owners). - Rooms away from the outdoor Carnaval Court bar will be quieter. - Choose a room facing the Mirage resort if you fancy a free show of an erupting volcano. - The Mardi Gras Tower tends to be the quieter one. 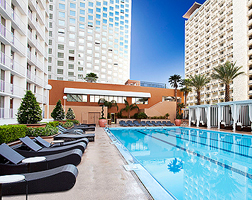 - A Total Rewards casino card can save you money when you reserve a room.